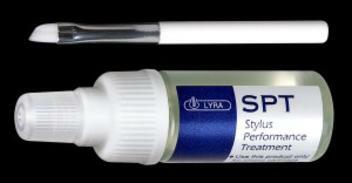 (SPT) is a purified water-based, non-alcohol stylus cleaner that helps keep cartridge styli scrupulously clean. In addition to highly purified water, SPT contains only very small amounts of organic chemical cleaning agents. SPT has proven to be completely safe to use with all phono cartridges (not only LYRA’s). Whatever the cartridge, excessive amounts of liquid should never be applied to the stylus and cantilever.